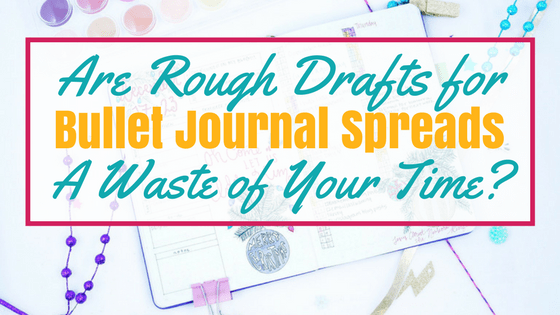 Are Rough Drafts for Bullet Journal Spreads a Waste of Your Time? Prior to this last month, I never made rough drafts for bullet journal spreads to help guide my drawings and layout outlines. I’m not the best artist out there, but certainly, I feel pretty confident in my ability to draw what I want and fix any mistakes. A couple of weeks ago I posted some information about how to overcome mistakes in a bullet journal. I noticed pretty quickly that it was a challenging issue for many artists in the community. One of the points that I touched on specifically related to preventing mistakes by creating a rough draft of whatever it is you are trying to make in your bullet journal. And I realized that it almost seemed a bit hypocritical of me to state this is a good solution without trying to see how well it actually works. For those of you who have always used pencils to make a rough drafts for bullet journal spreads anyways, you may find it surprising that I’ve always just used pens and markers to create my layouts. Personally, it’s not so much confidence in my ability to draw and letter. It’s just that I’m impatient! I want to get things done the first time and I don’t want to do it again. If I can usually fix my mistakes, why bother? The key word is ‘usually‘. There are still times where despite attempts to fix a mistake, I just have horrific (if not WORSE) results. And generally, I had no other choice but to accept those results with changing mindset and humor. Do Rough Drafts Make a Difference? I asked some of my social media accounts what they thought of my idea, and honestly many replies actually seemed surprised I never made done rough drafts for any of my spreads. A lot of people swear that it’s helpful. So for the month of December, I vowed that I was going to make rough drafts for every bullet journal layout first. I think pencil first made a HUGE difference. More specifically, I would create each spread in pencil before using any pens or markers. 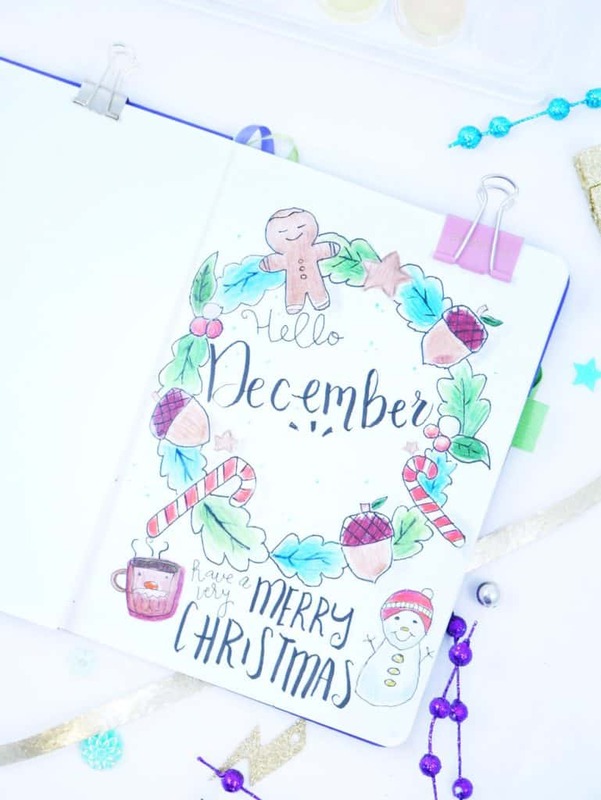 The very first spread I used a pencil for was my ‘Hello December’ cover page. It features a beautiful wreath adorned with a gingerbread man and candy canes. Perfect image for a ‘festive’ theme! I drew the wreath portion first. It was actually pretty simple, mostly easy to draw leaves in a circular pattern. Finishing the wreath though, I immediately noticed that it was in the shape of an oval. Not a circle. 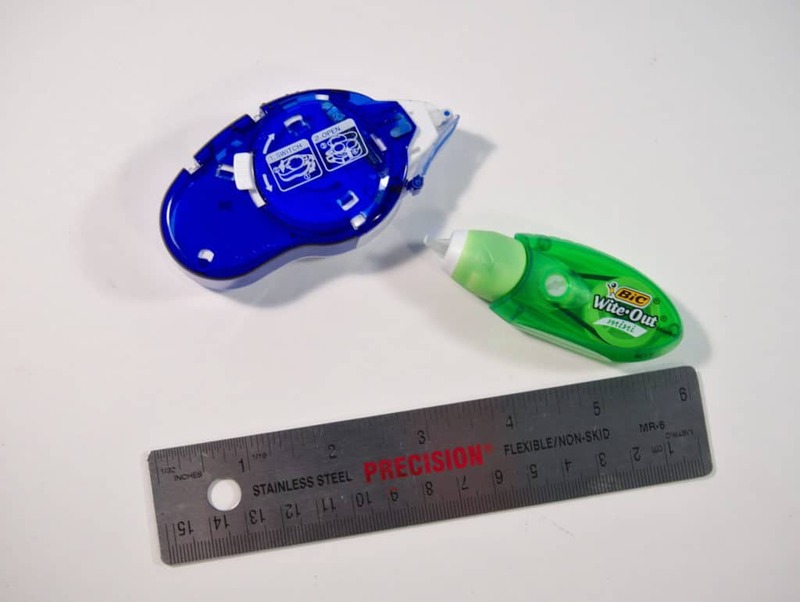 Using a pen, I’d likely just have to get over the fact that it’s not quite the right shape. Instead, I used a pencil to shift the leaves up until the wreath was the appropriate circle shape. I erased the remnants from the oval and kept moving on. The most surprising thing to me was how easy it was to fix this mistake with pencil and eraser alone. As you can see, the results for the page turned out AMAZING! Continuing to other spreads and layouts, I found that using a pencil first contained powerful attributes that I never really thought of before. Rough drafts really do help me optimize the page! I could easily control my letters and words. If I made a word and noticed it was going to be too long, it was so simple to erase and shortened the letters. It made my lines much less ugly because I could erase my dots to connect lines. When I miscalculated a number, all I needed to do is erase and write in the correct number. Drawing over later with a pen was a breeze. And with high-quality materials, erasing was simple. My pen didn’t smear, and the majority of the pencil lines went away without a trace of existence. Making rough drafts was an amazing experience. I can’t say that every single aspect of the process was worthwhile or easy. Since this was my first month creating rough drafts for bullet journal layouts, I can’t say if I’ll continue to have the same issues. It’s possible many of these ‘issues’ could go away with practice and different materials to use. Not every mark erased perfectly. I still occasionally made the odd pen mark because I couldn’t trace perfectly over the pencil line. My page sometimes bent while erasing pencil marks. This happened more as a result of my Prismacolor colored pencils, but some of the pencil material waxed up the tips of my fineliners. At least one of my fineliners is no longer functional. I do think that with some practice, most of these issues are resolvable. Did Making Rough Drafts Take More Time? In some ways yes. Obviously, the more complicated and detailed the page is, you’re going to have to double the amount of time to go over it in pen. This spread definitely took time! But it’s beautiful! However, in terms of fixing a mistake, I definitely believe that making rough drafts for bullet journal spreads reduced the overall number of mistakes I made. 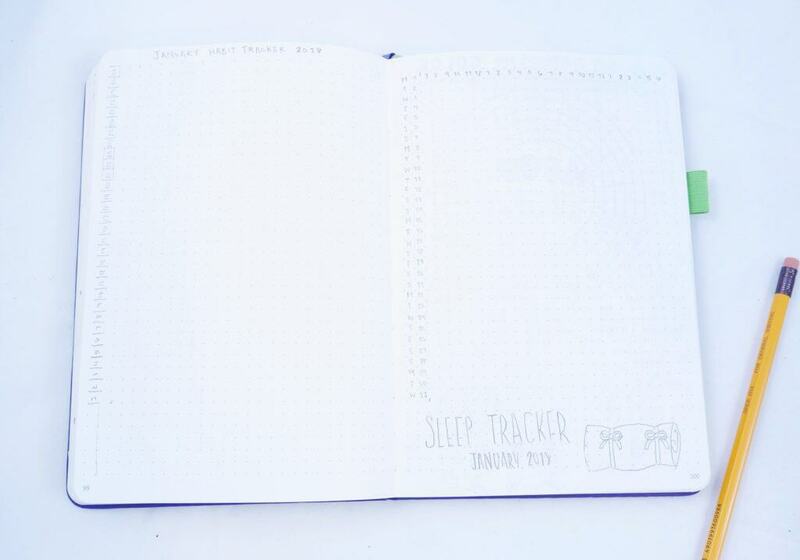 There were fewer mistakes when I created my sleep log (typically I make 5-8 mistakes in pen, but only made 1 mistake with a rough draft first). On the whole, it does take longer to create rough drafts for bullet journal spreads. After factoring in the time it takes to fix mistakes, I estimate doing an entire monthly spread (6 spreads for monthly, 4 for weekly) probably did add an additional hour of work. While it took a bit more time, in the long run, I felt a lot more satisfied with the finished product. I was definitely more mindful of my layouts with a bullet journal rough draft, so I made a lot fewer mistakes than I usually do. It didn’t eliminate all of them! I’d be willing to venture that I made 75% fewer mistakes by creating rough drafts for bullet journal layouts. Issues aside, I am confident that I’ll rough draft my bullet journal spreads in the future. Maybe not every single spread I ever create! But I’d say confidently I’ll make rough drafts for bullet journal spreads 50-75% of the time. I think it will not only improve my art in the long run, but I’ll be happier with the final results. I received a few questions from the community after posting some of my spreads and thoughts on using pencil! For your benefit, I decided to include them in case you had similar questions. Do I Have to Rough Draft Every Layout? Absolutely not. You can do only one page in your bullet journal, or you could do all of your layouts with a rough draft. If you have certain pages you are more confident creating, then no pressure. Do I have to Rough Draft Every Part of One Layout? No, you do not! Break down and rough draft what you need the most assistance with. If you need help with spacing for your lettering, then just rough draft the words. If your doodles aren’t fantastic, make a rough draft of those! There’s no hard and fast recommendation for how much or how little you want to make bullet journal rough drafts. 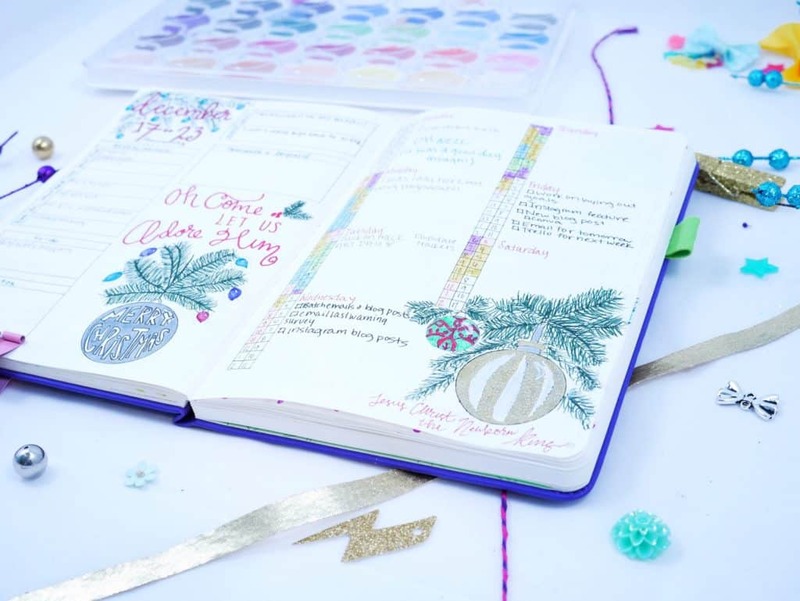 It is up to you to experiment and determine what your needs are with bullet journals. Why Should I Make a Rough Draft First? You’ll make fewer mistakes. You will be able to fix mistakes much faster. If you’re constantly frustrated by the way your pages look, see if a bullet journal rough draft fixes those frustrations. You may find (much like I was!) that you will find satisfaction by doing your spread as a rough draft first. Also, if you feel like your art is where you struggle with your bullet journal, this may be your method to fix your challenges. Anything Else that Will Improve my Rough Drafts? 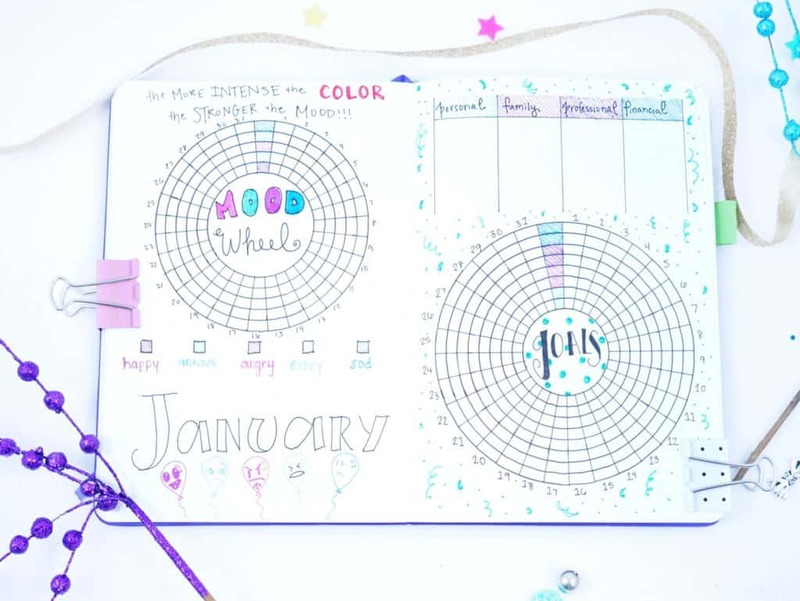 Use tools to assist with the rough drafts for bullet journal spreads. If your circles still look like ovals, you may find a stencil is helpful. These days you can find stencils in nearly any shape, form, letter, or number. You should also keep materials on hand to fix your mistakes. Use quality materials for your rough drafts. I can’t stress this point enough. You want a good eraser. So many erasers don’t erase well. I chose Tombow products for both my pencil and eraser and they were amazing. I mean, their pens and markers are amazing enough, at this rate I’m going to be a user for life for anything they provide! Beyond all else, remember that practice makes better, even with rough drafts! Would Anybody Not Benefit Doing Rough Drafts for Bullet Journal Spreads? Honestly, I think everybody could benefit with a rough draft in some form. If you struggle with drawing straight lines, or your doodles need a little work, try doing rough drafts for a while! See if you have improvements! If not, just don’t do them next month. It’s that easy, and not overly complicated. But if you don’t have a lot of extra time to work on your spreads, and you’re happy with the way they look anyways, don’t feel pressure to make one just because I said it was a good idea. Bullet Journal Rough Drafts are Worth It! I guess I have to concede to all of my teachers from Kindergarten through college; rough drafts really can help improve your projects. I know my friend Ashlyn creates rough drafts!!! This was a very fascinating and powerful experience to try. I can’t imagine that everything new that I’ll try in the future will be as successful. Trying rough drafts for bullet journal spreads for a month was so inspiring that I may try other month-long experiments in the future. 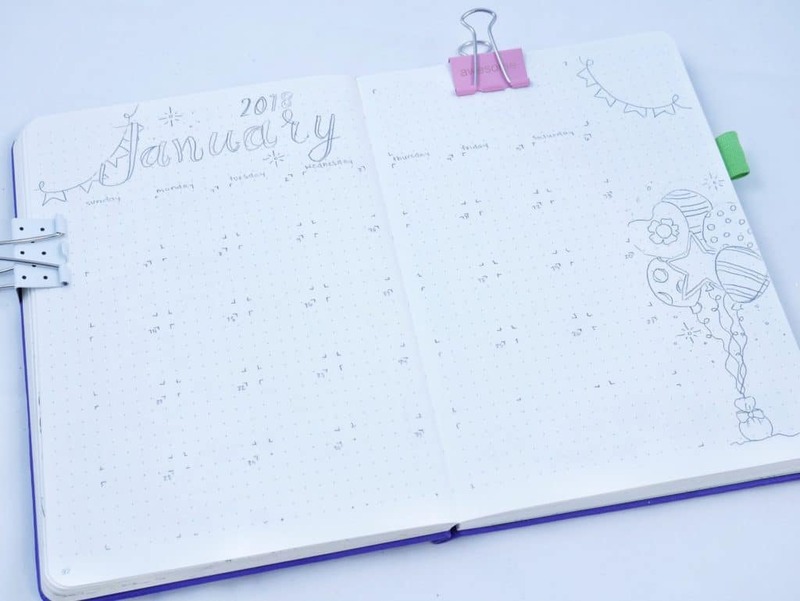 Do you make a rough draft of your bullet journal spreads? Do you find that it’s been very helpful? 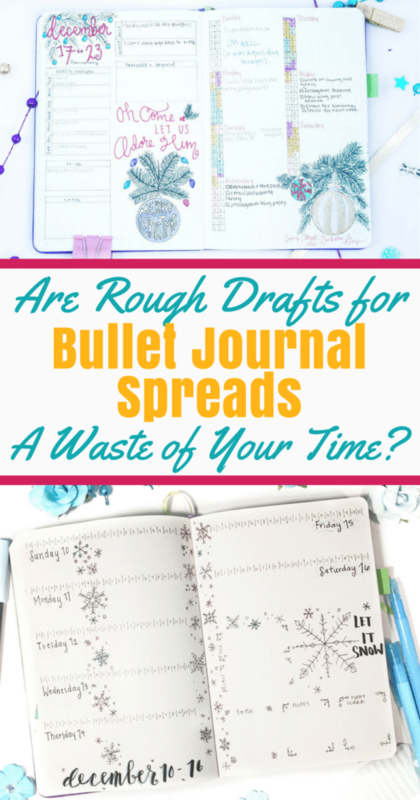 If you don’t make bullet journal rough drafts, what are some of your concerns? Tell me in the comments, I’d love to hear what you have to say! If this article helped you, please share on Pinterest! What? People do rough drafts for Bujo spreads? All the videos and instagram stories I have watched, it looks like it is free style! I feel a lot better knowing that there are people who do rough drafts! Thanks for the great post! 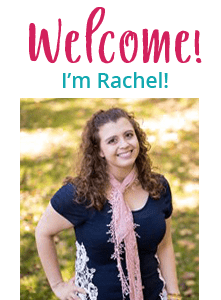 Greetings, Rachel. I love this post. Historically I have had a very functional planner — just the facts, ma’am. But one of my 2018 goals is to dress it up a bit. So making a rough draft in pencil will certainly help with page layout. Thanks for the tips. I seriously wish I could go back and time and make myself do rough drafts sooner. Glad it’s a benefit! Thanks for commenting!!! As an artist myself it seemed pretty odd not to consider making a draft in the first place. I just started bullet journalling this year, and when I started I just knew I should make a draft to decide what type of layout I wanted. And once I found one I liked, I drew it in pencil then went over it in pen. It’s the best way to do decorate anything with minimal mistakes. And on YouTube – there are quite a few videos where the person does have a pencil sketch but it’s very hard to see in the video. Unless you’ve drawn something 1000 times or generally are very skilled at drawing with pen then it’s unlikely that those very intricate designs were done without some extra planning. What bothered me is that it isn’t said enough – that making a draft is totally worth it! I wish I had started them sooner… I think it’s valuable for new people to know that a lot of professional artists do this!!! The detail is so much better if you work it out in pencil ahead of time. Thanks for sharing!! !